Remember the NFL's feigned outrage over sports gambling in Delaware? All that sanctimonious stuff about tarnishing the game's image and leading children to degenerate lives of laying the points with the Pats on the road? Well, apparently none of that applies to state-run lotteries. The New England Patriots are developing the first licensed NFL instant ticket with the Massachusetts State Lottery just days after league owners voted to allow teams to partner with lotteries across the country. "This is going to be a hugely successful collaboration," Robert Kraft, chief executive of Kraft Group, which owns the Patriots, said yesterday. "We are looking forward to helping the lottery generate much needed revenue for the cities and towns of Massachusetts." "This would purely be scratch-off and chance games. They are not in any way connected to the outcome of our games. That is a critical feature for us. We do think it is responsive to the pressures that states are feeling right now to help meet some of those budget shortfalls. It has been effective in other sports, and it is something that is a reasonable policy." 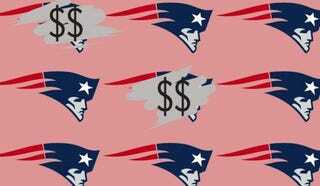 Most offensive of all here is the specious notion, pushed by both the league and Massachusetts state officials, that this is a gold-hearted, civic-minded response to the recession — as if NFL-licensed scratch tickets were anything but a heavily regressive tax that, first and foremost, will help the league make up for lost sponsorships. Of course, the rest of the NFL will surely follow suit now, and everyone will likewise push the idea that taking poor people's money is actually good for the economy, but meanwhile sports gambling is very, very bad. It's the NFL. Take the hypocrisy and lay the points.